Reneé Seward's last name is pronounced see-word, though some might not realize that when reading her name. So it's fitting that this University of Cincinnati associate professor created an app that helps users with reading, pronunciation and recognizing letters. Appropriately, the tool is called See Word Reading. Seward turned her idea—sparked from the desire to help one child who was struggling in school—into a bonafide business, thanks to UC's Venture Lab at the 1819 Innovation Hub, including funding and talent to support commercialization. The local business community is taking notice: Seward was a winner at the 2015 Cincinnati Innovates competition and the 2019 Cincinnati Business Courier's Innovation & Technology Awards. Creating innovative solutions to real-world problems like this is a key component to Next Lives Here, UC's strategic direction. "The heart of the tool is to imbed images inside of the letterforms to help cue a person to what sound associates with those letterforms," says Seward, who is also the communication design coordinator in UC's College of Design, Architecture, Art, and Planning. When a child using the See Word app on a tablet comes across a letter they can't identify, they can touch the letter. The tool then guides them to trace the letter, then cycles through images associated with that letter. For example, the letter "P" could feature images of a peach, peppermint and pie within the letter. When the user sees and hears those pronunciation cues, they can better associate the "puh" sound with the letter "P."
Seward first conceived the idea when she noticed her friend's son, who was diagnosed with dyslexia, complaining about the page layout of his tests. In reality, he was having trouble identifying the sounds associated with different letters. A graduate student in North Carolina at the time, Seward set out to develop an interactive tool that could help children with dyslexia and other at-risk youth learn to read, spell and pronounce words, building basic literacy skills. When Seward received her Master of Graphic Design degree in 2007 in North Carolina, she was invited to be a visiting professor at DAAP, where she had received her bachelor's degree in graphic design in 2002. 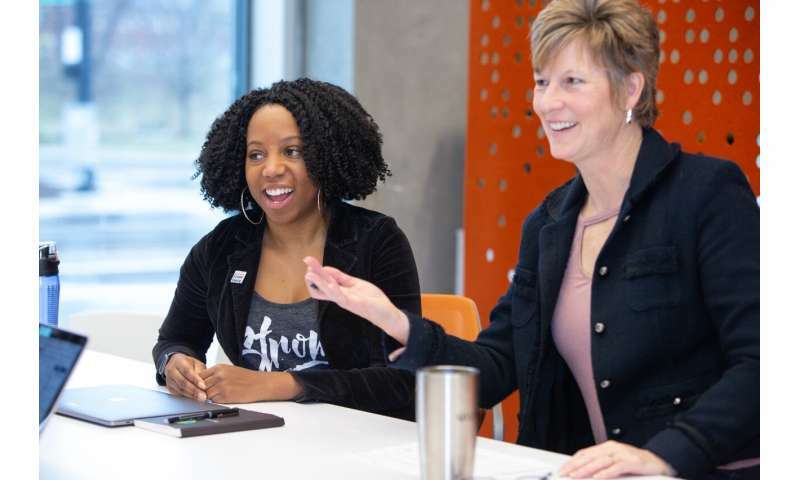 Seward brought her idea for a literacy app with her back to UC and teamed up with Allison Breit-Smith, an associate professor in UC's College of Education, Criminal Justice, and Human Services, to create a testable tool. Together with then-UC colleagues special education professor Pam Williamson, educational psychologist Beth O'Brien and interactive design specialist Ben Meyer, they developed a prototype based on the principles Seward created in grad school. The team first tested the tool at Mount Washington School, which serves pre-kindergarten through sixth grade in Cincinnati's public school system, as part of its after-school programming. The results were promising, but the numbers were small. Seward turned to UC's Venture Lab, the UC Office of Innovation's pre-accelerator program, to gain more education, funding and support. Housed in UC's 1819 Innovation Hub, the Venture Lab helps members of the university community turn their entrepreneurial ideas into viable businesses in a matter of weeks. At the end of the program, there's a graduation where members present their plans to a group of entrepreneurs-in-residence (EIR) from the Cincinnati startup business community. "The goal is that one or more want to jump into the CEO seat, help you think through the business model and help you use your funding to get it built and see if it can turn into a successful business so that it gets to market," Seward says. "She's been tremendous for me," Seward says of Koors, "showing me how to be a leader and the head of a company." "Entrepreneurial success at UC happens when innovation, downright determination, and critical startup resources all collide," Heikenfeld says. "Reneé brought the former two to the 1819 Venture Lab, where UC connected the latter, and when that happened, this opportunity absolutely caught fire." Today the See Word app is still being tested at Mount Washington, which Seward refers to as her "ride-or-die school." Instructors like preschool teacher Ebonne Torain appreciate how engaging the tool is. "I like that the See Word Reading app is interactive," she says. "It is more than just watching something on the screen. It requires they speak the sounds, trace letters and find the sound combinations in the stories. It forces them to pay attention to what is happening on the screen." Elsewhere, See Word is being tested in the local Princeton city schools, Cincinnati Preparatory Academy, the YMCA, Cincinnati Children's Hospital Medical Center and Beech Acres Parenting Center. But it's not just in the Cincinnati area—children on the other side of the world are using the app in Singapore. Beth O'Brien from the original See Word team left UC in 2012 for the National Institute of Education in Singapore, but continued her work on the project. She introduced the app to Singapore's prime minister of education, who helped the team refine it so it would work for bilingual children there, making See Word an international effort. See Word Reading is now in a three-year pilot program in five elementary schools there. Seward continues to receive positive feedback on the app, with countless anecdotes from teachers describing how the tool is helping students meet their reading goals. Last year when Seward was introducing the tool to a Cincinnati-area school, she witnessed a kindergartner being admitted to school for the very first time, mid-year. He didn't know any of his letters, couldn't recognize his own name and had disciplinary issues. At the end of the school year when Seward returned to the school to interview teachers about using See Word, she discovered the student had been using the app to help meet his target. After a few months, there was an increase in the amount of letters and sounds he could identify and he quickly began to recognize his name—and the teacher attributed that to See Word. In fact, because so many students enjoy using it, Seward has been told, teachers often use it as an incentive to behave and complete other work. "The kids don't refer to it as See Word," a play on Seward's own name, "they call it 'Eyeballs,' because my logo looks like an eye," she says, laughing, "I love it. I should have named it 'Eyeballs!'" Looking ahead, she's working on new font technology that will aid in literacy and hopes to expand the app to include stories for all ages, so her tool can teach English to adults as well. Seward notes that one of the biggest inhibitors of employment is a lack of English literacy. "I want to make an impact on at-risk kids in the inner city—that's where my heart lies—but the idea that I can help anyone who doesn't have the access to learn to read is exciting," she says.